A.P. 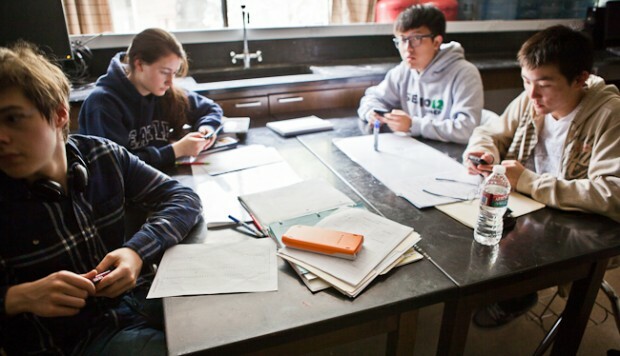 Chemistry students use their cell phones to answer their teacher's question. When we talk about using cell phones in class, we’re not just talking about using cell phones in class. At its core, the issues associated with mobile learning get to the very fundamentals of what happens in class everyday. At their best, cell phones and mobile devices seamlessly facilitate what students and teachers already do in thriving, inspiring classrooms. 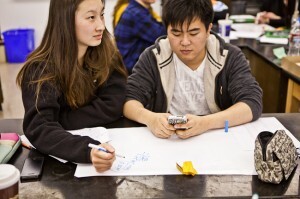 Students communicate and collaborate with each other and the teacher. They apply facts and information they’ve found to formulate or back up their ideas. They create projects to deepen their understanding, association with, and presentation of ideas. This is part four of a series exploring mobile learning co-produced by MindShift and Spotlight on Digital Media & Learning. Will Old Teaching Tactics Work? In the Digital Age, Welcoming Cell Phones in the Class. In the most ideal class settings, mobile devices disappear into the background, like markers and whiteboards, pencil and paper – not because they’re not being used, but because they’re simply tools, a means to an end. The “end” can be any number of things: to gauge student understanding of a concept, to capture notes and ideas to be used and studied later, to calculate, to communicate, to express ideas. In Ramsey Musallam’s A.P. Chemistry class at Sacred Heart Cathedral Preparatory in San Francisco, cell phones are a natural extension of the way he communicates with his students. As soon as kids walk in, Musallam sends out a text blast through Remind101, asking them a challenge question that’s related to the day’s lesson. “First person to tell me the units on K for a second order reaction gets chocolate,” he types and sends off. His students know he does this regularly, so they’re constantly anticipating the question during the day, in and out of class. Once the class settles in and things are rolling along, the steady hum gets louder when kids are excited or working together, then quieter again when they’re working out problems on their individual little whiteboards (to be clear, these are not digital). Musallam constantly walks around, sending out directives – “Write the answer on your table!” ““I want you guys to come up with an answer now, and text it in,” “What’s the ridonculous choice out of all these answers here?" “This way, if I need to explain a common question, everyone can access it,” he says. “I don’t have to repeat myself going from group to group.” But rather than stop what everybody else is doing so he can explain a concept, students can watch the video he just created if they need to. “I’ll just tell them to look at the online tutorials to find out about common questions,” he says. 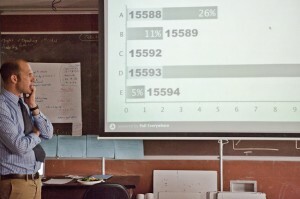 Ramsey Musallam considers the online poll reflecting his students' answers. During class, he asks students to take a multiple-choice quiz and send in their answers through a poll on their cell phones. The students’ votes are immediately displayed on the projector that’s hooked up to Musallam’s laptop. Musallam can list a litany of reasons why and how mobile devices spice things up in class. “The data integration wouldn’t be as rich, the experience wouldn’t be as dynamic, the cognitive load is higher,” he says. But even though all but one of his students have cell phones and use them for polling and instantaneous quizzing, it’s clear that they would be just as rapt in the classroom activities without them; they’re not necessarily fixated on the fact that they’re using cell phones or that they’re seeing instantaneous results of their polls. Their eyes and ears are on him. 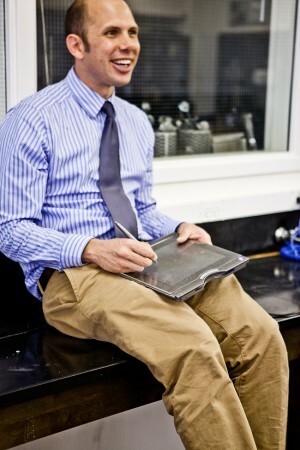 What makes Musallam’s class an interesting case study is that his teaching practice is based on a specific technique: he incorporates peer-instruction and inquiry-based learning, mirroring Harvard professor Eric Mazur. The videos and polls just help support that. Seventh-grade history teacher James Sanders, who teaches at Kipp San Francisco Bay Academy, makes the analogy of the cell phone as a tool being used in a modern-day shop class: It makes things a lot easier. As Mussallam writes on the iPad, it's being shown on the projector. Though every student in his history class has a Google Chromebook, only 60 percent have what he calls “smarter” phones, and many have iPod Touches. So he has students work in groups of three or four. Using Socrative, an app that shows real-time poll results for both multiple-choice and short-answer quizzes, he challenges his students at the end of class to answer specific questions in order to get a broad look at whether they understood the concepts discussed that day. “Writing concise paragraphs explaining complex concepts is incredibly powerful,” Sanders says, adding that the class also works on research papers and projects around historical characters in addition to these short polls. But for every teacher who’s able to seamlessly integrate cell phones and other mobile devices, there’s another who doesn’t see the transformation as easily. Paul Barnwell, who now teaches English and digital media at Fern Creek Traditional High School in Louisville, Kentucky, decided to stop using cell phones in class after giving it a go with an eighth-grade class. Barnwell bucked the school’s policy and used Poll Everywhere for both multiple-choice and open-ended exit poll questions. About three-quarters of the students had cell phones at the time. "Writing concise paragraphs explaining complex concepts is incredibly powerful." But he was uneasy with excluding those who didn’t have a phone or the ability to text. And, he said, some of the “class clowns” took advantage of the anonymity of the polling to text inappropriate statements. “I decided it wasn’t worth the time or the hassle,” he says. Barnwell doesn’t like the idea of letting students Tweet information to a common address and hasn’t found an application that “promotes efficient ‘best practice’ yet. “But I'm also not seeking it out,” he says, adding that because he’s got 10 desktop computers in his current class, students can use them for research projects and looking up facts online. It’s not uncommon for kids to use cell phones for inappropriate behavior at school. But some believe that when students misuse the devices at school, teachers must step in. Cell phones are just another tool, like pen and paper. At Sacred Heart, where Ramsey Musallam teaches, the school's cell phone policy is shifting, as they try to sort out their social policies. “Right now, kids can’t use cell phones unless a teacher instructs them, but that’s evolving,” says principal Gary Cannon. But if kids are using them to take pictures, they’re not reprimanded by faculty. The staff fully recognizes that the cell phone is just a tool. Twitter and texting are just tools used to say or do what might happen in the hallways and dining halls regardless. “The challenge is giving them a sense of a digital footprint,” Cannon says. For Musallam, that’s all part of how he sees his job as an educator.